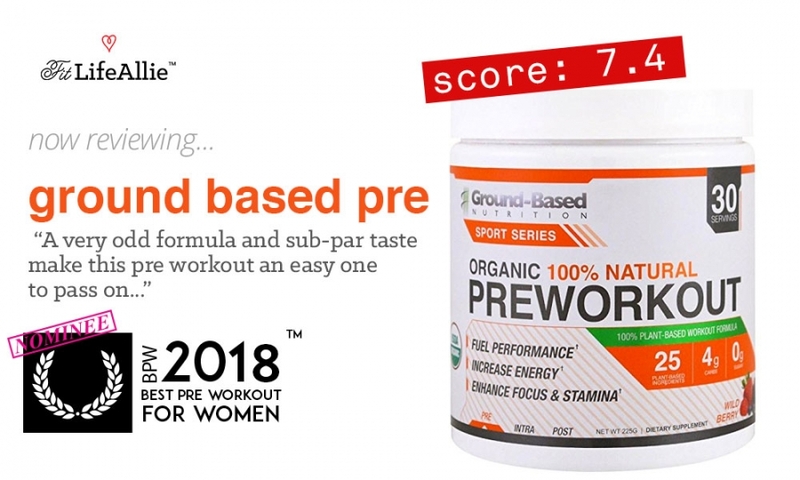 Ground-Based Nutrition Organic pre workout reviews are easy enough to find but today I’m going to give it the BPW treatment and in true Allie Lewis fashion, I’m going to undress this pre workout from the outside in to let you know EVERYTHING you need to know about this pre workout formula. I’m going to tell you about the flavor, the formula, the effects (i.e. if it works), and then I’ll even grade the packaging. If that all sounds good to you, why don’t we dive right in and get started on this fantastic Ground-Based Nutrition pre workout review. I came across Ground-Based Nutrition originally at Whole Foods a few weeks ago, and ended up trying one of their protein powders originally. I actually just published that full review a couple days ago so if you want to check that out you can- I Ground-Based’s protein to be a GOOD protein but not a GREAT protein. So I was pretty curious to see if their pre workout was going to be a similar style where it’s good but not great. So. What IS the verdict? Let’s start by looking at the flavor. Ground-Based Nutrition Pre Workout Tastes Really Really Bad. There’s just no sugar-coating this one, folks. Ground-Based makes one very foul-tasting pre workout. Actually a sugar coating WOULD really help things because seriously this stuff tastes just horrible. I mean horrible. It is supposed to be a Wild Berry flavor, and while yes, it does have some berry notes to it, there is a very bitter aftertaste that is completely unpleasant. I honestly despised the taste. It’s also not very sweet at all so if you do have a sweet-tooth of any kind, Ground-Based Nutrition Organic pre workout is going to disappoint you on the flavor. So. Yeah it was a rough start for GBNs pre workout. Let’s now discuss whether or not this pre workout actually WORKS. Does Ground-Based Nutrition Organic Pre Workout Work? What does that even mean, does a pre workout, work? What does it do if it is working? Well, a pre workout should provide energy, endurance, strength enhancement, and sometimes a pump element. Ground-Based Nutrition Organic Pre Workout has actually very few of those four main things. The most important thing to most people is the energy, and I will say thankfully Ground-Based Nutrition’s Pre Workout DOES give a little bit of energy. Not crazy amounts by any stretch of the imagination, but definitely a good little pop. I had a scoop and half today before by bootcamp-style class, and I was actually pleasantly surprised with how the product did give me a nice little lift in energy. The other criteria, I was not quite as impressed. Ground-Based Nutrition Organic Pre Workout gave me zero increase in strength or workout endurance capacity. It literally was like I had drank a glass of water. Water gives the same strength gains as Ground-Based Nutrition Organic pre workout. Same with endurance. Just nothing there to speak of. There is a nitric oxide blend in the Ground-Based Nutrition Organic Pre Workout that I do think gave me a bit of added vascularity but it is hard to say for certain. Overall I did not like how this pre workout performed. Let’s look at the ingredients and see why that could be. What’s in Ground-Based Pre Workout? Whew. Right? Isn’t that a bizarre formula? It’s a weird formula in my opinion. Very weird. I mean. You get some caffeine from the green coffee bean and tea, but other than that, sheesh. What is goji going to do for your workout, really. Especially at these itty-bitty dosages that they must be in. Yeah. I just don’t love this Ground-Based Nutrition Organic pre workout formula very much. Look I understand the whole Organic thing. I get it. I really do. But when I want pre workout, I don’t care about organic or if it’s made from sugar, spice, and everything nice. I want something that’s going to WORK. And that’s where I think Ground-Based sort of lost me. I just don’t find this to be a very effective pre workout formula at all. I just don’t. Ok. Let’s talk about the packaging now. Ground-Based Nutrition Organic Pre Workout packaging is Not Good. Packaging is usually one of my favorite elements of a product, but unfortunately Ground-Based Nutrition TRULY dropped the ball big-time on that front with their pre workout packaging. I think the product looks really bad. Really cheap. Really unimaginative, and overall low-end. The funny thing is that I thought that Ground-Based actually did a pretty good job on their Ground-Based Superfood Protein powders. But this. This is bad. White background with faint orange diagonal lines comprise the majority of the ‘artwork’ (if you could call it that), and the information just feels very cluttered to me. I don’t like the flavor image either. It literally looks like Ground-Based Nutrition pulled it off google images and slapped it on there. So. Yeah. Just not a very good effort from a packaging standpoint. Why don’t we wrap this thing up. Ground-Based Nutrition missed on this pre workout. Yes, it provides a small bump up in energy. But other than that, I found this pre workout to be a little bit of a waste of money. Ground-Based 'Superfood Protein' is OK, but has a few flaws.